Scott Springer grew up in Minnesota, far from the ocean. During his senior year at Carleton College, he participated in a marine biology program that was held on Catalina Island and in Monterey, California, and then he knew that he wanted to study the ocean. After graduation, he found a position as a research assistant in marine ecology at the University of Massachusetts Boston and the Marine Biological Laboratory in Woods Hole. Now certain of his interests, he applied to graduate school in oceanography at the University of Washington. While a graduate student, his interests changed to focus on the physics of ocean circulation. 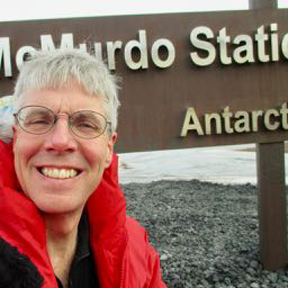 He studied the mechanisms responsible for El Niño for his masters degree and the dynamics of the strong currents located on the western sides of tropical oceans for his Ph.D.
After many years at Oregon State University, Scott returned to Seattle to work at Earth and Space Research in the fall of 2008. Today he spends most of his time using the excellent computational facilities available at ESR to perform computer simulations of ocean circulation. Recently he has been applying techniques he learned for modeling the circulation off Oregon to coastal regions of Antarctica. Both areas are biologically productive, but the physical causes of the productivity differ, and much can be learned by comparing them. One very important difference is that sea ice affects the interactions of the ocean and atmosphere in Antarctica, and Scott is now spending much of his time learning how to model the effects of ice. In his free time, Scott enjoys hiking, mountaineering, rock climbing, backcountry skiing, and cycling. Springer, S. R., R. M. Samelson, J. S. Allen, G. D. Egbert, A. L. Kurapov, R. N. Miller, and J. C. Kindle (2009), A nested grid model of the Oregon Coastal Transition Zone: Simulations and comparisons with observations during the 2001 upwelling season, J. Geophys. Res., 114, C02010, doi:10.1029/2008JC004863. de Szoeke, R. A. and S. R. Springer (2005), The all-Atlantic temperature-salinity-pressure relation and patched potential density, Journal Marine Research. 63, 59-93.
de Szoeke, R. A. and S. R. Springer (2003), A diapycnal diffusion algorithm for isopycnal ocean circulation models with special application to mixed layers, Ocean Modelling, 5, 297-323.
de Szoeke, R. A. and S. R. Springer and D. M. Oxilia (2000), Orthobaric Density: A Thermodynamic Variable for Ocean Circulation Studies, Journal of Physical Oceanography, 30, 2830–2852. Springer, S. R., and M. Kawase (1993), Nonlinear and Dissipative Dynamics in the Connection Region Between Western Boundary Currents and Equatorial Currents, J. Geophys. Res., 98 (C7), 12,511–12,525. Kawase, M., L. Rothstein, and S. Springer (1992), Encounter of a deep western boundary current with the equator: A numerical spin-up experiment, J. Geophys. Res., 97, 5447-5463. Springer, S. R., M. J. McPhaden, and A. J. Busalacchi (1990), Oceanic Heat Content Variability in the Tropical Pacific During the 1982–1983 El Niño, J. Geophys. Res., 95(C12), 22,089–22,101.